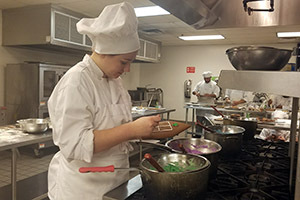 If gumdrop rooftops and candy cane driveways sound yummy, bid on a gingerbread house crafted by the culinary arts students. 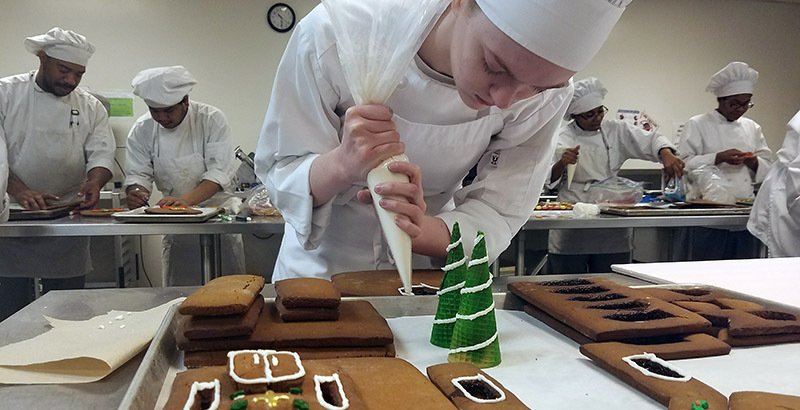 If gumdrop rooftops and candy cane driveways sound yummy, bid on a gingerbread house crafted by the culinary arts students of Tidewater Community College. and decorations to their gingerbread houses. All proceeds benefit Children’s Hospital of the King’s Daughters. 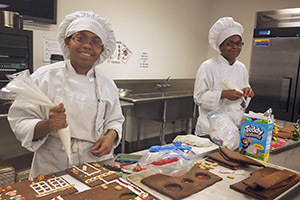 The gingerbread houses will be on display Dec.13-14 from 1 p.m. to 4 p.m. in the culinary arts dining room of the Walker Building of TCC’s Norfolk Campus, 350 Granby St. To view the houses, email news@tcc.edu. Bids can be emailed to Sarah DiCalogero at sdicalogero@tcc.edu. The houses will be available for pickup on Dec. 15. Jessica Martinson, who aspires to be a pastry chef, said she spent nine hours making her template and a 3-D model before building her house. icing to perfect the details on her house. For more information about culinary arts at TCC, contact Don Averso, program head, at 757-822-1350 or daverso@tcc.edu.